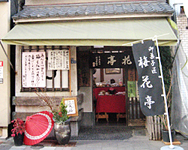 Thayne-san, today we’ll be visiting Baika-tei, a confectionery shop founded in the third year of Kaei (1851). It was founded in Shinkawa, the modern name for Reigan-jima, but we’ll be going to the Monzen-Nakacho branch. The current owner’s name is Kichie Mochizuki. I’ve been to Monzen-Nakacho several times before. 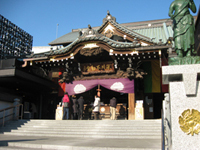 I prayed at the Fukagawa Fudo and went to see the Tomioka Hachiman Shrine Festival. People along the street pour water on the those carrying the portable shrine―it’s a really interesting festival. So Baika-tei is midway up the path to Fukagawa Fudo Temple… Is this it? （望月） ようこそ、セインさん。望月です。 Welcome, Thayne-san. I’m Mochizuki. It’s good to meet you, Mochizuki-san. Your shop has a great atmosphere to it. Thank you. You must’ve been surprised by the size of the shop. One group of guests is already full capacity. There isn’t much variety in sweets, either. To begin with, your “America Manju,” made by the founder, is quite famous, isn’t it? That’s right. After Matthew Perry arrived in 1853, and Westerner’s affection for baked things became known, the shop’s founder got the idea to bake sweets using an oven like we use to bake bread nowadays. These days it’s not unusual, but at the time there weren’t any Japanese sweets baked in an oven, and it became a sensation. Ever since, it’s been one of our best-selling items. It’s also been said to be the inspiration for chestnut manju. Both the long shape of the manju and the “America Manju” logo written on the cellophane wrapping give it a nostalgic feel. It’s really nice. And the combination of the salty outer layer and the sweet shiro-an (sweet white bean paste) go really well together－it’s delicious! The walnuts on top have a nice fragrance that goes perfect with it. （望月） ありがとうございます。嬉しいです。 Thank you. I’m glad to hear that. I have an odd question. Were you able to sell any sweets with the name “America” on them during World War II? During the war, we couldn’t get any ingredients, so we couldn’t make any of our sweets, not just the America Manju. We couldn’t even get sugar or azuki beans, so the shop was closed. Please also try the dorayaki. It was first made by the shop’s second generation. Thayne-san, since you’re an expert on Japan, I’m sure you know dorayaki, but ours are a little different. Wow, you’re right. It’s totally different from a regular dorayaki with the azuki sandwiched between two layers of sponge cake. This has only one layer, but it still has the red bean paste inside. How do you make them? We use a special dough, and make each one by hand. . . The rest is a trade secret, right? The azuki is light, and the cake has a springy texture. It’s great! All your sweets are really unique. You sure get a constant flow of customers. The shop is on the path to the temple, and there are a lot of elderly people, but recently it seems that the number of young people has been growing as well. A minute ago a young couple came in and bought a single dorayaki. I think they’re going to share it as they walk up the path to the temple. That’s sweet. I see lots of parents come in with their children, the kids holding their mother’s hand. Mothers come buy sweets for their married daughters who come home for a visit. From here, you can see wonderful little glimpses into the lives of people. One customer said she always stops by the shop after praying at Fukagawa Fudo, and another group said they always came here with another good friend during New Year’s every year, but he passed away, and so they wanted to send sweets to his family. Each customer has his or her own personal story. That’s absolutely right. And because this is the shitamachi (old residential area of Tokyo), there are also lots of locals from the neighborhood who come in every day. One lady buys two or three sweets every day on her way to the swimming pool. Buying sweets from your shop has become a part of her routine. You’re lucky to have so many great customers. Thank you. One of my relatives runs this shop, and I run the original store in Shinkawa. Our Kodenmacho shop is even smaller than this, but we make our well-known Kirizansho and Kurimushi-yokan during the Bettara Ichi Festival in the autumn, and some customers especially look forward to those two days. You make lots of people happy! What a wonderful job! Seeing lots of people come in to buy sweets and leave with smiles makes me feel good too. Thanks for giving us a peak into your shop. Well Thayne-san, shall we pray to Fudo now, before we leave?